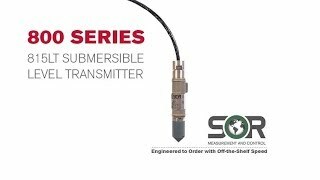 815LT Submersible Smart Level-Pressure Transmitter - SOR Inc.
0-35 ft. w.c. to 0-575 ft. w.c. 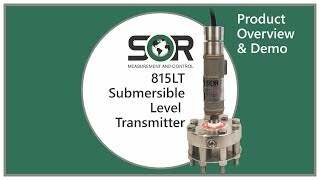 The 815LT submersible smart level-pressure transmitter is a rugged, compact, loop-powered instrument that is ideally suited for applications where the transmitter is frequently or continuously submerged in fluids. 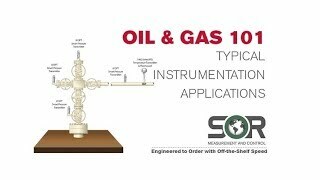 The transmitter’s vented cable design allows for reference to atmospheric pressure at all times in order to obtain highly accurate pressure or level readings. The 815LT is designed to measure gauge pressure or hydrostatic pressure for level output. 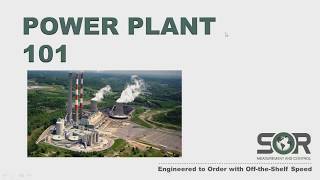 The 815LT is easily configured using HART®7 communication protocol and Modbus RTU Serial Communications. The transmitter can also be set by placing a magnet on the outside of the housing in order to reset the zero and span.